Cutting an onion produces a series of chemical reactions that releases an irritant known as propanethial S-oxide. This irritant is the culprit that causes the eyes to fill with tears. The best way to prevent tears from escaping is to chop the onions in a way that produces less irritant and keeping the irritant from reaching your eyes. Here are a few tips for cutting onions without all the sobbing. Keep in mind that some of these methods may work for some people and not for others. It depends on the individual person and tolerance level. In any case even if you are provided with a little relief it is better than none at all. Trust me it is worth a shot! 1. Chill the onions in a refrigerator beforehand. When onions are cold, propanethial S-oxide will evaporate in much lesser amounts. You might still get some irritants but will not be as bothersome. 2. Leave the root on. Cut the rest of the root before cutting the root as the tear inducing fumes are concentrated in the root. 3. Use a sharp knife. A sharp knife will cause less damage to cell walls, and fewer irritants will be released. 4. Keep the exposed cuts away from you. As soon as you cut an onion in half, turn both halves down on your cutting board. Leave the side you aren't currently chopping unpeeled. Once you've finished with one half, move the diced onion into a prep bowl, and set it on the opposite side of the kitchen, before proceeding with the rest of the onion. 5. Give your onions a refreshing soak. Place them in a bowl of water for about 15 minutes. Remove and chop them. The water absorbs the onions sulfuric compounds thus taking away the chemical release responsible for causing your eyes to sting. Notice: This method make cause your onions to become slightly milder. 6. Run the vent hood. 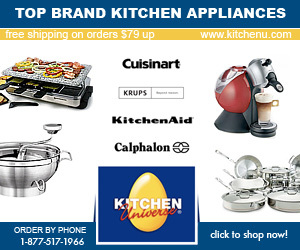 Position your cutting board next to the stove and turn on the exhaust fan. Irritants will be pulled away from you and your eyes. 7. Light a candle nearby. The flame will help take some of the fumes that cause tears. 8. Wear goggles. Would you believe that there are actually goggles specially made to wear while cutting onions? There are. However any cheap pair of swim goggles will work just as well at fighting off the stinging effects that comes from cutting onions. 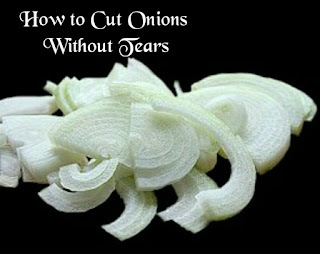 Does cutting onions make you shed tears? Have you tried any of the above methods before? Did it work?